I Blew It With the Broccoli… Again! I was really optimistic about my broccoli this year. Last year I grew it from seed by sowing it directly in the garden, which didn’t go well at all. I had a handful of plants come up, but only a couple of them actually got a head on them, and it took forever! I also expected them to get much bigger than they did, so I kept waiting and then before I knew it, they bolted. Same thing this year, though this time I got a much better start. I bought plants instead of trying to sow seed in the garden, which is definitely the way to go. I also installed an app called “Gardenate” on my smart phone and I recorded when I planted the broccoli. Gardenate allows you to keep track of when you plant each crop in your garden, how long each takes to mature, and approximately when you can expect to be harvesting them. The broccoli plants were looking great all spring, though I did have a battle with cabbage worms, which took no time at all to find us. 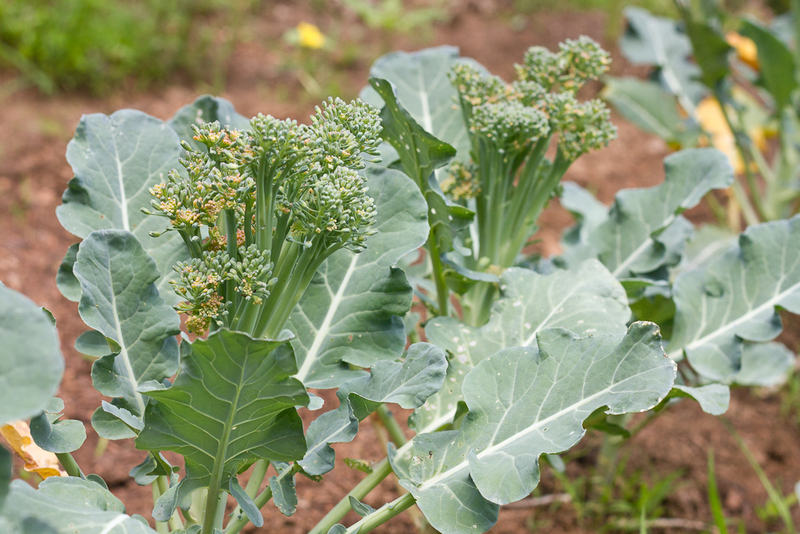 Even still, I got the caterpillars under control and the broccoli heads were filling out nicely until one day I went out there and found a second round of caterpillars boring holes through the heads and pooping all over the plants! (Grrrr!) I dealt with the caterpillars again and hoped the broccoli would recover. Shortly thereafter we got several hot days with thunderstorms. The next time I was out there to check on them, the plants were bolting! I thought it might be too late, but I picked the heads off most of the plants, washed them, and put them in the fridge. Here is how they looked when I picked them. We steamed some for dinner and though they looked a little more like broccolini (broccoli rabe) than broccoli, they still tasted like broccoli should and they were very crisp. I’m disappointed that I blew it again and missed the window, though. Like last year, I was waiting for the heads to get bigger instead of realizing they were mature and would bolt soon. Even though I did catalog my broccoli using Gardenate, I hadn’t been checking the program to check my predicted harvest time. To be honest, some crops in my garden haven’t grown as fast as the app (or even the seed packet) said they should, so I wasn’t putting much stock into what Gardenate said. However, I did go back to check when it said I should have harvested the broccoli and it actually did say it would have been ready just a few days before it bolted. So, moral of the story when growing broccoli: 1) plant transplants rather than sow seeds, 2) keep the caterpillars in check 3) don’t wait for small-but-mature heads to get bigger and 4) watch the broccoli closely, looking for signs that the flowers are getting ready to open, so you are sure to harvest them before they bolt. I plan to grow a fall crop of broccoli, so we’ll see if I can do better next time around. Third time’s a charm, right? If you have any tips for growing broccoli, I’d love to hear them! We eat a lot of it around here, so I’m going to keep trying to grow it. I did better this year with the plants I started from seed, but I still don’t have a system down and don’t completely know what I’m doing; I left some plants in the trays for much too long and it seems to have stunted their growth. The plants that I re-potted first were clearly the most happy. I waited a couple of extra weeks past our last frost date to plant tomatoes and peppers and, with the cold nights we had in late April, I carried these plants in and out of the garage each day for about a week. It was only within the last couple of weeks that I started to put them in the ground, and the garden began to look complete. The warmer weather coupled with the plentiful rain we received over the last few weeks has really given the garden a boost. Here’s the garden on April 26th. Here it is just two weeks later, on May 10th. Don’t my potatoes (left middle) look great? The beans got a cold and soggy start and weren’t looking great, so I pulled some of them and replanted. I also planted a row of sweet potatoes last Sunday. I ordered them through a mail-order catalog and would you believe this is what they looked like when they came? 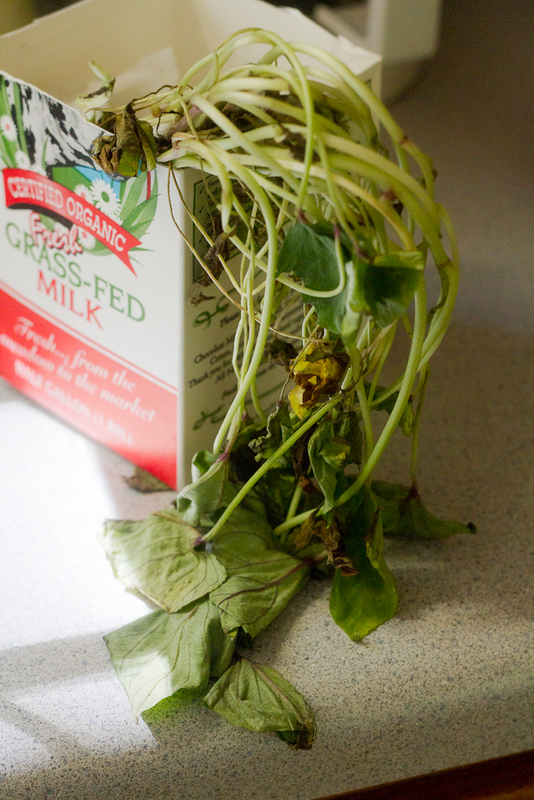 The instructions that came with the plants mentioned that they might be wilted and that I should not be concerned; they are resilient plants and should recover “under the right conditions”. I guess we’ll see if we have the right conditions. Lastly, there has already been a visitor in the garden foraging on my plants and it appears to enjoy eating the entire plant! It leaves nothing behind but a small hole in the ground where the plant used to be. So far I’ve lost a tomato plant, a Brussels sprout plant, and a sweet potato plant. I don’t remember this happening last year–entire plants disappearing. Based on the hoof print in the fresh mud that I saw the other day, I suspect its deer. I’ll have to start mixing up a home-made deer deterrent. Last year I tried Deer Scram, which seemed to work, but it’s pricey. If you have a tried-and-true deer deterrent that doesn’t involve chemicals or firearms, I’d love to hear it! By the way, did you notice the children’s garden in the photos above? It’s growing like mad! All of the plants in there are far outperforming the crops in the main garden! I’m not sure what their secret is but I’ve got a lot of work to do! The days are getting longer and the weather is starting to warm. That means it’s time for me to talk about my garden. In the spring of 2010 we moved to from the DC suburbs to central Virginia, where your hard-earned money gets you a lot more real estate. We were excited about the additional space that our new place afforded us and looked forward to making some improvements to the property. At the top of my husband’s list was a garage and at the top of my list was a garden. Our second child was due late that spring and, hard as I tried to talk my husband into it, putting in a garden that first spring or summer just wasn’t realistic. However, I was determined to get a head start on the garden the following year! The contractors broke ground on the garage late in the fall and, since they were making several deliveries of building materials, we took advantage of the situation and ordered some additional supplies for our future garden… namely a truckload of topsoil and several lengths of 16-feet-long 6″x6″ boards, so that we could make a raised bed. The soil here is laden with red clay and doesn’t have a lot of organic matter, so bringing in good topsoil was essential. 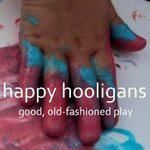 While Shane watched the construction of the garage out the side windows of our house, dreaming of the fun he’d eventually have in there, I stared out the back window at the giant mound of dirt in the yard, dreaming of the fun I’d eventually have in there. I was so excited to get a head start on the garden that I bought a heated germination station so that I could grow my own plants from seed. (This is really just a covered seed tray that acts like a mini greenhouse.) I thought it would be a fun project to do with my son, so we planted the seeds in the tray together in early March, the same time we started prepping the garden. Unfortunately, I decided to start with tomato and pepper seeds, which I now realize aren’t the easiest to grow. I had six varieties of tomato and two types of peppers in the tray. Most of the tomatoes grew, though not very vigorously, and only one of the two varieties of peppers grew. Nonetheless, the majority of the seeds did actually sprout and we had fun watching them grow. Once mid-April rolled around, I was ready to start planting. We got some cauliflower, cabbage and broccoli plants and put them in first, along with some yellow and red onions. Then we sowed some rows of seed: spinach, kale, arugula, and some mixed lettuces. Next we planted three rows of yukon gold and red potatoes. In the middle of the garden we put in a row of posts and ran some string between the posts. There we planted sugar snap peas, which would climb the posts and strings. Next we sowed two rows of carrot seed. After the carrots we planted two rows of tomatoes, both the six varieties we grew from seed and four roma tomato plants we bought. We also had some pepper plants (bell, jalapeno, and poblano) in with the carrots and tomatoes. Lastly, we planted a couple of rows of green beans in among squash (yellow, acorn, butternut, spaghetti, and pattypan), pumpkin, cucumber, and melon (watermelon, sprite, and cantaloupe) all from seed. 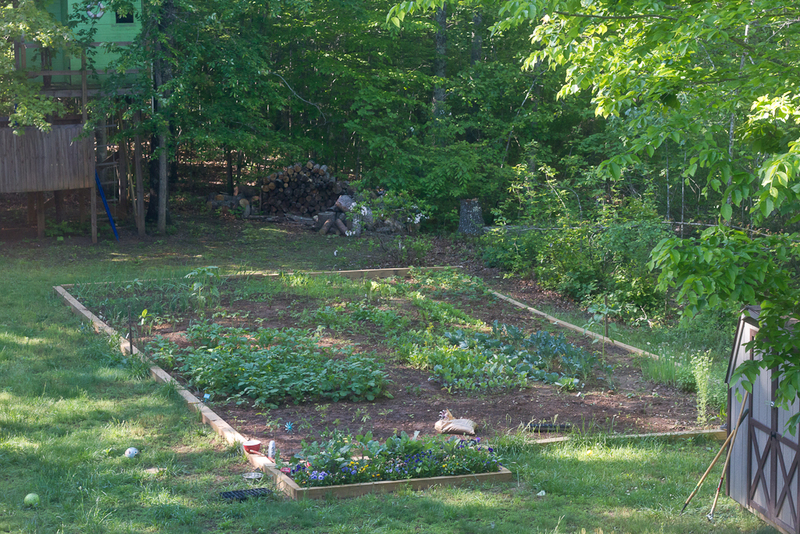 There were also a couple of patches at the far end of the garden where we planted some sweet corn and some strawberries. I didn’t really lay out what would go where before sowing and planting. We basically just started from one end of the garden and kept sowing and planting until we got to the other end. This was all over the course of several weeks, based on what was appropriate to plant at particular times. As the growing season went on, I found it helpful to refer to the Mother Earth News website. They have a section titled “What to Plant Now”, where you select your region and the month and it lists which plants are good to grow at that time and how (sowing, transplanting, or growing indoors). When the garden first started growing, it looked very orderly… all of the plants in nice neat rows among rich brown weed-free soil. As the weeks passed, some plants grew better than others, weeds filled many of the spaces in between the plants, and I started to plant little sections of additional crops I wanted to try, breaking up my orderly rows: a few radishes here… some okra there… turnips, chard, beans, etc. I also sowed marigold, nasturtium, cosmos, and sunflower seeds in small patches throughout the garden. These flowers would (hopefully) attract beneficial insects that would help control the unwanted insects. By the end of the season the garden was very much a patchwork of fruits, vegetables, flowers, and herbs. Our garden, mid-summer. That's a 10-foot sunflower towering over everything in the middle and some butternut squash vines trailing out the left side. If you grew tomatoes yourself this past year, you probably know it wasn’t a good year for them. Most of my tomatoes would begin to rot before they were ripe. We got a lot of rain early in the season, which might have been partly to blame. It was a big bummer, really, because I was looking forward to another garden-related first: canning tomatoes! 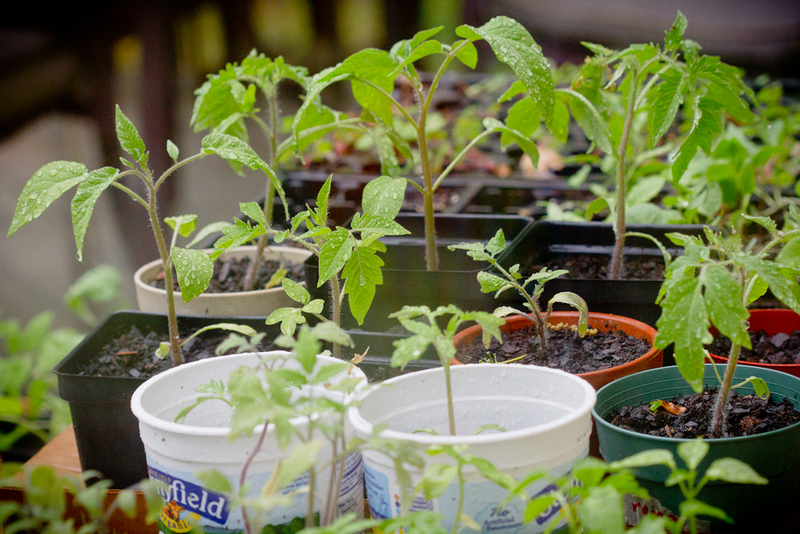 The tomato plants that did the best for us were the cherry tomatoes we grew from seed and the roma tomato plants that we bought at a local farmers market. I was able to can 8 or 10 quarts of tomatoes, and most of those were the romas. If you want to grow (and maybe even can) tomatoes, you can’t beat romas! In fact, my 1-year-old daughter’s favorite treat from the garden were tomatoes. I was in the garden daily, even if it was just for a moment after work to simply look at it and enjoy it. My daughter wasn’t walking yet, so I’d often pick her up and take her for a little stroll around the garden. Every time we were out there she would pick a tomato and bite into it right there… red juice dribbling down her chin and all. If we were inside and she spotted a bowl of them on the counter, she’d point to let me know she wanted one for a snack. Don't let the stern look fool you. He LOVED digging up the potatoes! Not only was the garden a source of food, but it was also a source of creativity for me. I enjoyed taking pictures of the plants, especially when they were blooming. I made this one into a 16x20 canvas wrap to hang on the wall. I love it. 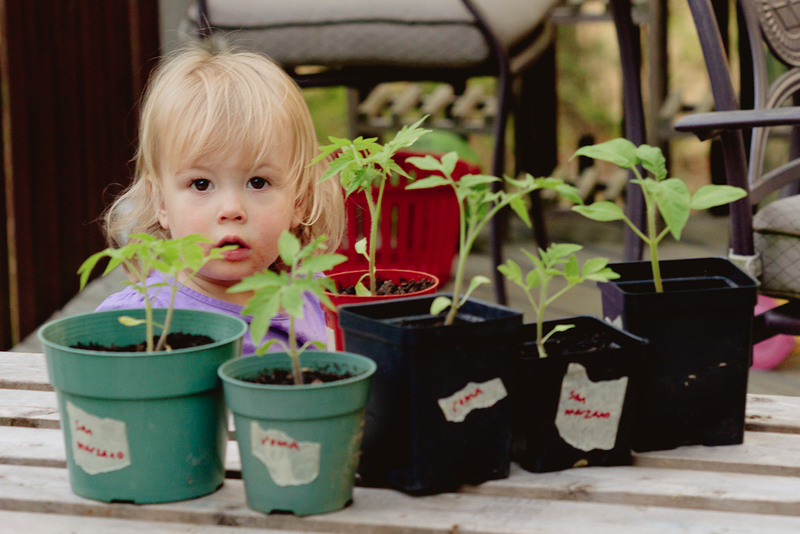 It was hard to keep up with maintaining the garden, with two small kids keeping us busy. We pretty much took a plant-it-and-let-it-go approach. I don’t like to spray for bugs or weeds, so there were several times over the summer when the weeds got out of control…. especially around the onions. I’ll try to do better with keeping up with the weeding this year. Now that we’re heading into spring, I have a couple of goals for this year’s garden, most of which involve better planning. First, I’m going to lay out (on paper) what I’m planting where, with the aim to rotate the location of my crops every year. I also plan to orient my rows perpendicular to the way I had them last year to better take advantage of the sunnier and shadier parts of the garden, and I’m going to try to use the garden space more efficiently, probably by planting more in blocks or double rows, rather than in single rows. Next, I need to keep track of when I plant certain plants, thin them to avoid overcrowding, and harvest when they’re at their peak. Last year several of our plants stagnated as they grew because they simply ran out of room; I sowed them from seed but didn’t thin them like I should have. Others did well, but I was afraid to pick them too soon, and before I knew it, it was too late. I had a beautiful row of spinach that I was happy to admire, until the weather got too warm and it bolted and became bitter. Then we couldn’t eat it. Finally, I plan to preserve more of the goods from the garden. I did a little canning, freezing, and dehydrating last year. This year I’m going to kick it up a notch and do more. We got a dehydrator for Christmas, so look forward to putting it to work! 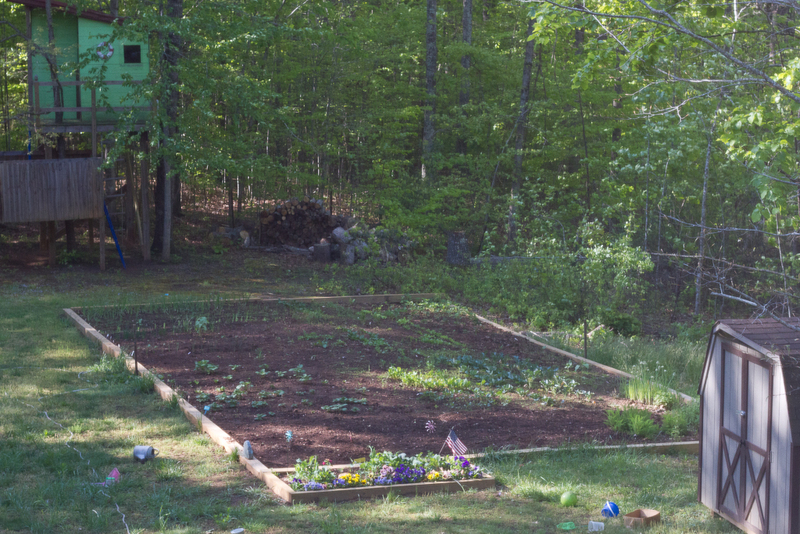 I can’t wait to get our 2012 garden under way! We’ve already started sowing some seeds in trays and I’m following through on my “resolution” to plan out my garden first to improve its efficiency. If you have been thinking of starting a garden–get to it! It can be intimidating, but it’s not rocket science. Really, all you need is soil, water, sun, and some seeds or plants. Pick some that you like, plant them in the ground (when the soil and air temperatures are warm enough) and see what happens! You have nothing to lose. It’s actually great exercise, it gets you in touch with nature, and it allows you the gratification of knowing you grew some of your own food. And who knows… you may even love it! I’m a mom and wife who adores my family, has many interests, and wishes there were more hours in the day to enjoy all of it. Enter your email address below to receive my blog posts in your inbox.